My summer garden is overflowing with tomatoes and cucumbers and that means one thing … gazpacho! 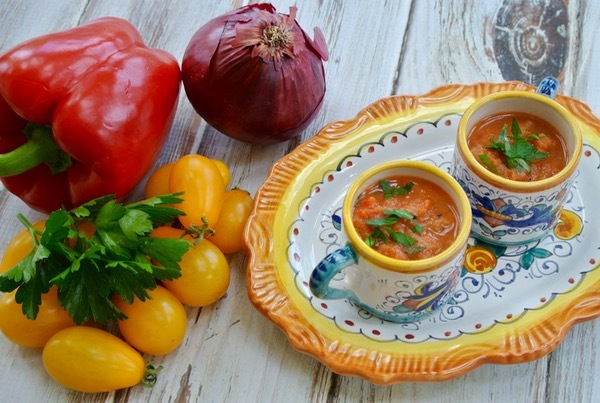 Gazpacho is a raw vegetable soup most often with a tomato base and typically served cold. It is certainly a refreshing way to enjoy the summer harvest. We have a few gazpacho recipes already here on Recipe Rebuild but I was inspired by my Vitamix cookbook to finally utilize my Vitamix blender for more than just shakes and smoothies. At times I like a chunky and thick gazpacho like Mom’s recipe here but after enjoying a recent Gazpacho appetizer that was served much more smooth in texture I knew I had to replicate it at home. An unforeseen bonus to this new recipe was that my children LOVED the texture claiming it was just like salsa. When your 15 year old son asks for second helpings, you know the recipe is a keeper! 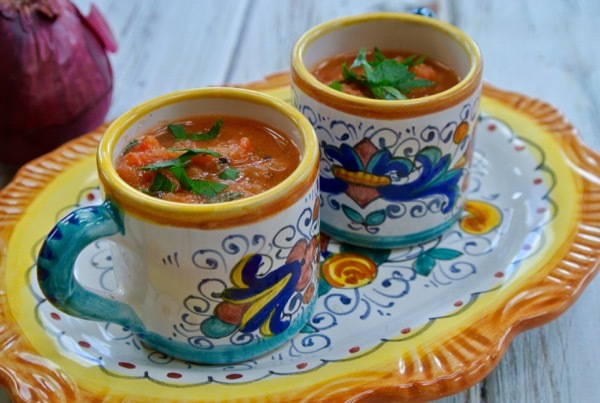 I love serving soups in little espresso cups as shown above but of course a nice big bowl of gazpacho works equally as well. Place the garlic cloves, oil and vinegar in the vitamix and give it a whirl until the garlic is completely minced. Add the remaining ingredients, turn the blender on low and gradually increase to medium speed, taste for and seasoning adjustments and adjust accordingly. Pour the gazapcho in a container, cover and store in the refrigerator for at least one hour and up to overnight as the flavors enahnced with time. 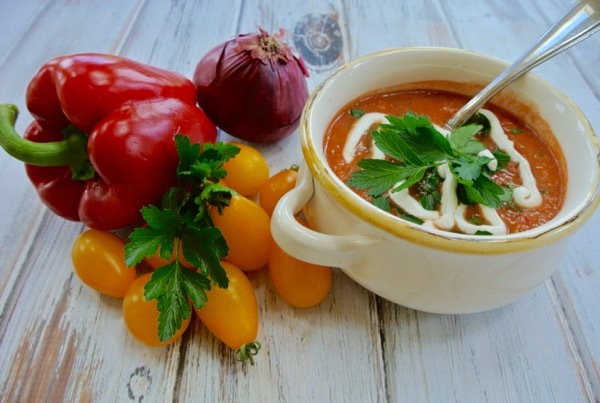 When it is time to serve, ladle the gazpacho into bowls and garnish each portion with a dollop of crème fraîche or sour cream and additional shredded parsley.